We received a report from a former employee of The Millcroft Inn in Alton. The employee is a Torontoghosts member and wanted to share their former place of employ as a definite spot for ghosts and hauntings enthusiasts. This person worked odd hours and late one night, was asked by an auditor if they'd like to see the "hot spots" of the Inn. The person of course agreed and went exploring the inn. 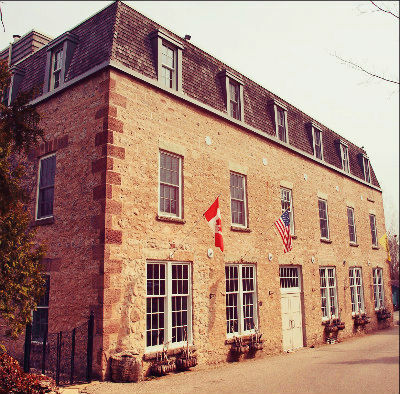 "He (the night auditor,) took us outside and crossed to the Conference center (another old building directly in front of the main Mill entrance on the same property, although I cannot recall the name). We walked through the front doors, he stopped, and said "just wait". We all stopped in silence waiting for something to happen. Sure enough, about a minute after, we all heard faint, then heavy footsteps amongst the ducts running throughout the conference hall, however they seemed to be initiating from the second floor. This, as we were told, is a regular occurrence which he heard nearly every night while making his rounds. There was no mistake as to the sound... they were definitely footsteps." "In addition, he claimed seeing a figure standing in the window often when patrolling the property at night. This dark figure would simply stare out the window looking straight ahead, and eventually fade after a few moments. Unfortunately I never saw this myself." "After we left the conference hall, he took us to another building named "The Manor House" (a more 'upscale' area for guest rooms, about 10 in total). It was apparently a half-way house way back when. This is the heart of most haunts at the Mill. I had heard about and saw a stack of complaint cards behind the front desk regarding the Manor House regarding apparitions, sounds, cold drafts and smells." "The night auditor took us to the top penthouse suite, where I almost instantly felt uncomfortable. No cold drafts or anything to this nature, but simply felt as if one or more additional people were in the room with us. After about 5 minutes, a garbage can underneath a counter started making tapping sounds, not too loud, but it sounded as if someone was knocking on it with their fingers. I got enough nerve to pick it up... and it continued tapping in my hands (I could feel very light knocks to the metal, which made me feel extremely uncomfortable). It was a very uneasy experience, as I never thought I'd experience something like this first hand. The can stopped tapping a few moments after I put it back down."